It's a while since I have written a post here, mostly because there isn't much change in the garden. Things slow down in winter, and it is time to look at seed catalogues by the fire or sit by the stove while the oven is heating. It has been cold, especially at night, and we have had more rain than usual (98 mm in June and about 50 mm so far this month.) I planted seeds for the few crops that don't mind germinating in the cold (onions, lettuce and peas) and "gardening" has been limited to mowing the weeds on the pathways so that I can still get to the garden beds and venturing out each afternoon to decide on dinner. Lately that has included a lot of potatoes, cauliflower, carrots, silver beet, kale and beetroot, along with eggs, of course, and vegetable soup with the last of my broad beans from last year and egg noodles (the chickens continue to lay fairly regularly.) Risotto with broad beans and vegetables has been regular too. 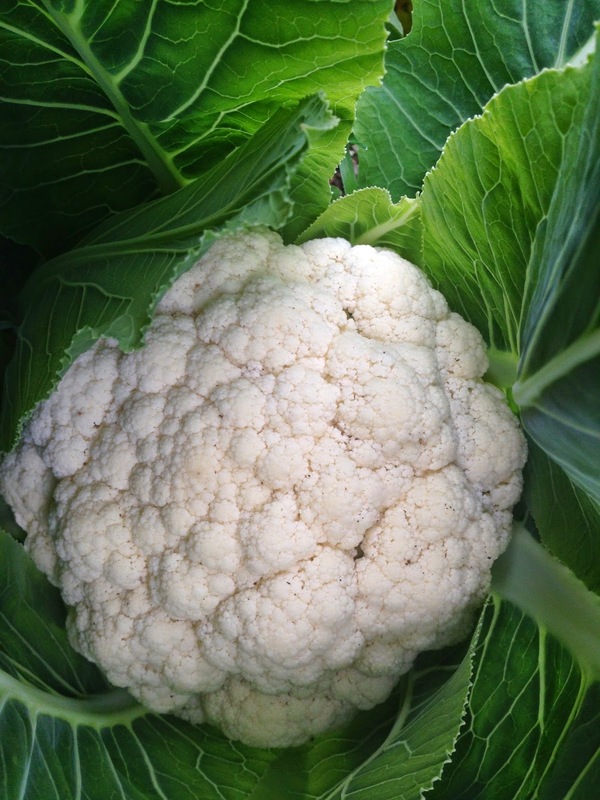 Cauliflowers have done very well this year…. We have had two frosty mornings, making me wish that I had planted some brussels sprouts. They won't produce the sprouts without a few significant frosts, and as we hadn't had enough for several years, I had given up. Perhaps I'll try again next winter. Then onions. I have just eaten the last of my "normal" onions and only have a few spring onions and leeks left, and so I bought 8 onions (no chemicals) for $7. 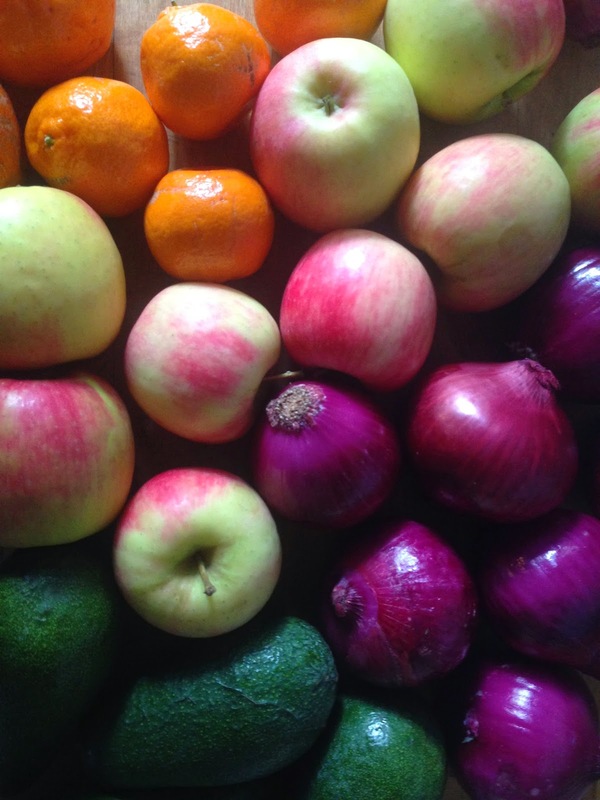 I also bought 9 apples for $8 (no chemicals there either.) From the market…..
For $8, I bought ½ kilo of "organic" brie cheese (organic here means no chemicals for the cows that produced the raw materials, and a loaf (actually more like a "baton") of ciabatta with fig and fennel bits in it. Altogether, I spent less than $50. I didn't stay for coffee. I never do. I came home to feed the dog and the chickens and then made my own coffee which I had with ciabatta and cheese. Most mornings I start the fire early to cook porridge and coffee before I do anything else. The fire (for coffee) was last on my list today, and it made me think about the order of business in various households. Years ago, when everyone cooked on a stove with a fire inside, someone had to get up early to start the fire and cook whatever was to be eaten. I'm sure that whoever did that ate food that didn't need any preparation… bread and cheese… always available and a means of preserving grain and milk. I have been thinking about how things must have been while investigating some of my family history. Wealthier households, whose way of life we copy these days (and assume that it is normal) would have had a servant to light the fire and cook whatever dishes were required… eggs & bacon, the kippers of English tastes or even toasted bread or pancakes. These days, cooked breakfasts are easily available with "instant stovetops" and electrical gadgets, and, in retrospect, my own children used to order various options as if they were in a fast food restaurant and I was a short order cook, all made simple because of the instant stovetop that I had at the time. The sun is supposed to shine later today. There are a few jobs to be done in the yard… a bit more planting (I try to plant something every week at least, so that I have something to eat every day), thinning some seedlings (carrots and onions) and collecting dinner.